This is a late pattern SS sleeve eagle produced in mid to late 1944. Their intended use was to be worn on the M-44 short field uniform. Thus they were made in the late stages of the war when workers, material, and time were short. Much like a silk screening process, the white material was masked out to form the eagle. Black ink was then used to cover the rest of the cloth. This left the eagles image when unmasked. The time and material expended to produce them was less than the woven eagles. They were issued but not in great quantities. 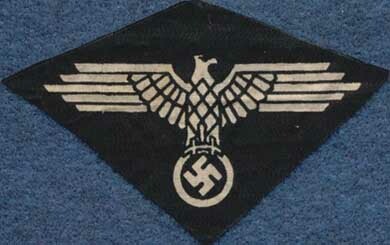 They are pictured on page 446 of John Angolia's book- Cloth Insignia of the SS. He adds that they never reached a high degree of use and are fairly rare. Get a genuine SS eagle at a fraction of the cost of the embroidered ones. I only have a few, so get them while they last. The one pictured might not be the one you receive, however, it will be of equal quality as they are all pretty much the same.